The Okame Cherry Tree is a beautiful flowering tree that is special because it is one of the few flowering cherries that will grow and blossom well in warmer zones, where other cherry trees cannot be grown. It will flower in January and February in northern Florida and in early spring when grown further north, where it also thrives. 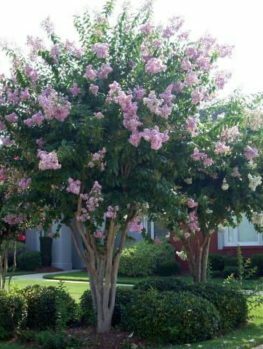 It puts on a spectacular display of rich pink flowers on a tall, upright tree that grows quickly – as much as 2 feet a year 2 to reach 20 or 30 feet tall in 10 to 15 years. 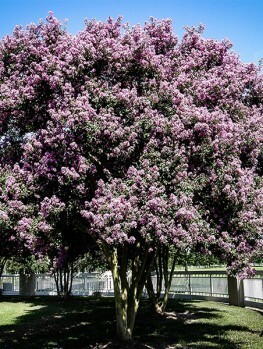 It can be pruned into a tree form or kept as a large shrub – the choice is yours. It is fast growing and adaptable to most conditions and deserves to be much more widely grown – in your garden. Plant the Okame Cherry in any well-drained soil, including alkaline soils, where plant choices can be limited. Water regularly in the first season, but established plants have moderate drought tolerance. Mulch in spring to conserve water and keep the roots cool. 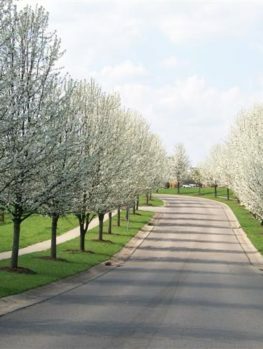 Unlike some other cherry trees, it rarely suffers from the pests or diseases that can disfigure cherry trees every year, so the foliage is always healthy and an attractive green – turning red, orange and bronze in fall in cooler zones. 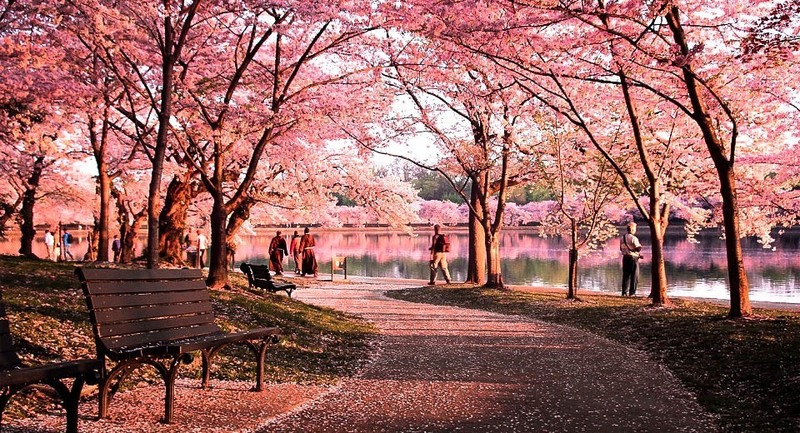 The spectacular beauty of the Japanese Cherry Festival is well known, as is the National Cherry Blossom Festival in Washington, D.C. These flowering cherries can be choosy about where they grow and often do better in cooler regions. 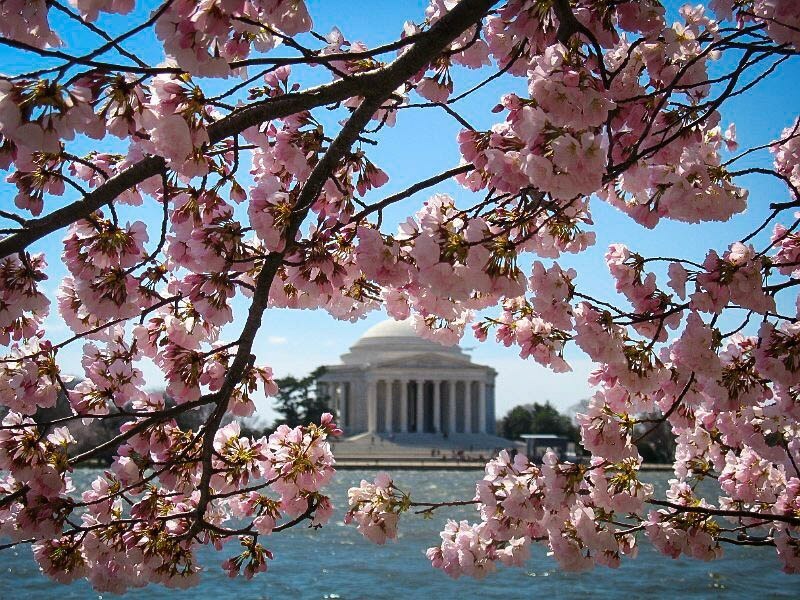 So, if you want to enjoy the beauty of cherry trees and you live in the warmest parts of America you need to grow the Okame Cherry Tree, which will flower right down into Florida. 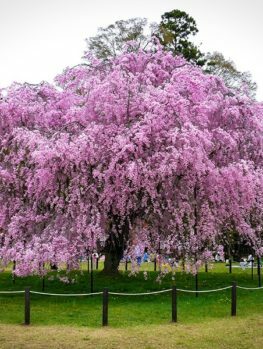 That doesn’t mean you should forget this plant if you live further north because it is a spectacular beauty that is easy to grow and makes a wonderful companion for the Yoshino Cherry and the Kwanzan Cherry. 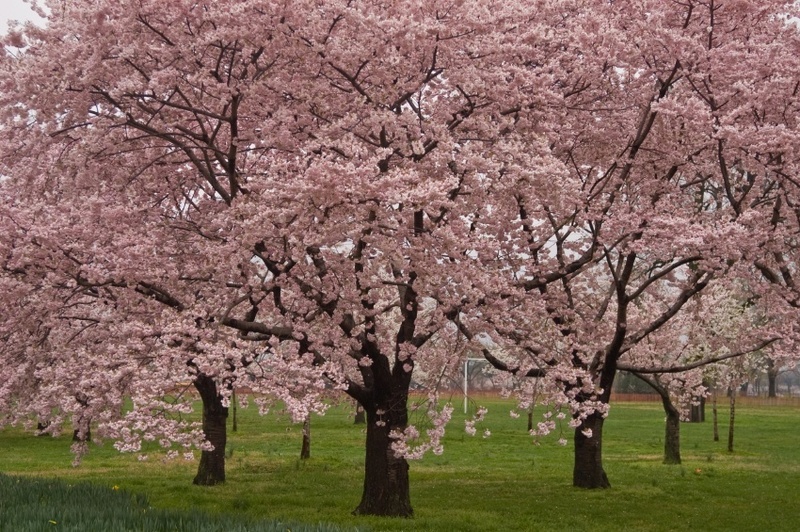 Every spring your Okame Cherry will burst into bloom with hanging clusters of bright pink flowers on the bare branches. 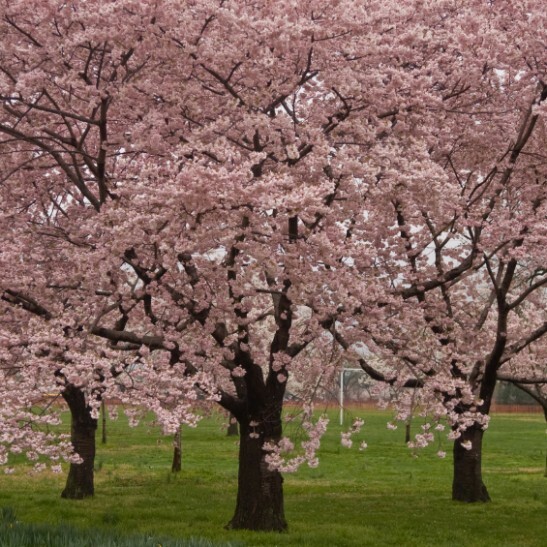 It is one of the earliest cherry blossom trees to flower, so it will also extend the cherry season in your garden if you mix it with other cherry blossom trees. It can be used as a lawn specimen, among large shrubs or for a spectacular effect, to line a driveway or walk. It is also a great plant for natural plantings with native trees or in informal gardens. Although usually grown as a tree, it can be encouraged to grow as a large bush by cutting the central branch out when young. The Okame Cherry Tree is known botanically as Prunus x incamp ‘Okame’. It is a hybrid between Prunus incisa and Prunus campanulata, both wild Japanese species of cherries. Although it has a Japanese-sounding name, the tree was actually bred by the famous English flowering-cherry authority and plant breeder, Collingwood Ingram, who produced this plant around the middle of the last century. Many flowering trees take their time to develop, but not this one. 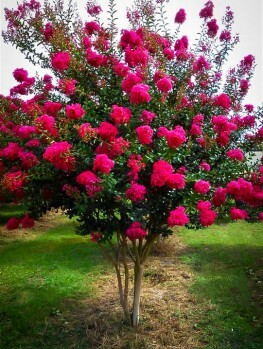 It can easily grow over two feet a year, so in a few short years you will have this beautiful tree gracing your yard and dazzling your family and friends with its gorgeous carmine-pink blossoms. Unlike some cherries it is a reliable bloomer and year after year it will put on a show for 2 or 3 weeks, bringing spring in with a bang. The Okame Cherry Tree is also one of the easiest cherry blossom trees to grow. It will grow from the warmer parts of zone 6 and almost into zone 10, which is the tip of Florida. It needs very few cool days to give it sufficient chilling hours to allow it to bloom, so it is a terrific choice if you live somewhere where 320F is a novelty. It prefers full sun but will happily tolerate a little shade. It is not particular what type of soil it grows in and will do well in clay and alkaline soils. It prefers moist but well-drained soil but once established will tolerate some drought. 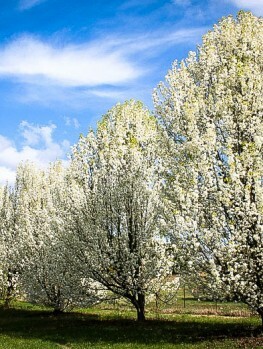 It is generally pest and disease free, unlike many other cherry blossom trees that can develop a variety of problems. 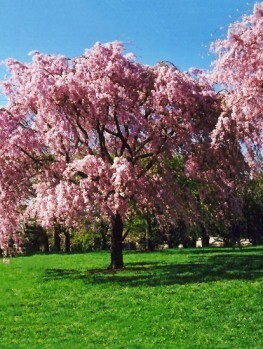 The Okame Cherry will grow rapidly into a tree 15 to 30 feet tall and the same size across. It will produce its rich pink flowers as early as January, or later in the spring, depending on when it is grown. The blooms are remarkable both for their strong color and for the density with which they cover the bare twigs of this tree. Blossoming lasts up to 3 weeks and is then quickly followed by the leaves, which generally stay healthy throughout the summer. In areas that get some fall coolness they will turn pretty shades of bronze, red and orange before falling. The bark is a dark, rich chestnut color and a little shiny. The fruit is small and insignificant. To plant your Okame Cherry tree, dig a hole three times the diameter of the pot and mix in some organic material such as garden compost or rotted manure. Add a handful of bone-meal or other phosphate-rich fertilizer. Place your tree in the center of the hole and replace most of the soil, firming it around the roots as you go. The tree should be the same depth when planted as it was in the pot, so don’t plant too deeply. Once most of the soil is back, fill the hole with water. When it has drained away, replace the rest of the soil. Water well once a week for the first season and after that when the soil is dry. Put mulch around the roots, especially in a lawn, to stop competition from the grass and prevent mower or string-trimmer damage. A little fertilizer or organic mulch in spring is helpful. No special pruning is required except to develop a trunk if needed, to remove crowded branches and to reduce the height a little. The Okame Cherry is such a special plant that only the exact plant will have the right color and growth rate. So it must be produced directly from trees absolutely known to be right. Our trees are grown the correct way, from branch cuttings of these special trees. That way every tree we offer is identical to the original so they will produce a very uniform effect when planted in a row. However, these take longer to produce, so avoid cheaper, seedling trees that will only be a disappointment.